www.okeechobeejust4bass.com was working for Capt Mike Shellen in the morning. 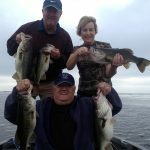 We fished shiners for 4 hours in overcast conditions with a water temp of 72.There were 3 guests today fishing and a great time was had by all! Here is a picture of the day.